For fans of The Guild, New Girl, Scott Pilgrim, Big Bang Theory, Veronica Mars, or anyone who has ever geeked out about something. 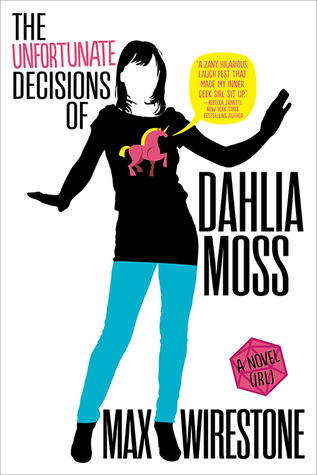 Meet Dahlia Moss, the reigning queen of unfortunate decision-making in the St. Louis area. Unemployed, broke, and on her last bowl of ramen, she's not living her best life. But that's all about to change. Before Dahlia can make her life any messier on her own, she's offered a job. A job that she's woefully under-qualified for. A job that will lead her to a murder, an MMORPG, and possibly a fella (or two?). If you are a geek, you will appreciate the humour in this book. I was drawn to the book by its interesting premise. A broke, unemployed, single girl. A murder. MMORPG. The prospect of romance amidst all of it. It had the promise of a fun, fast-paced new adult contemporary romantic comedy. While I didn't quite get what I was expecting (dial up the fast-pace and absurdity of everything and tone down the romance), I had a great ride nevertheless. Dahlia Moss is unemployed, broke and the last thing she wanted to do is participate in her generous if not slightly insane room-mate's evening costume party. At least, that's what she thought until a man wearing a fake beard and a blue pin-striped captain's outfit offered her a job to find his missing spear - that's right - a spear. The Bejeweled Spear of Infinite Piercing, to be exact, in the MMORPG Zoth. The next thing Dahlia knows, her employer turns up dead, stabbed by a real-life version of the stolen spear. So now, not only does Dahlia have to roam the Kingdo of Zoth for the missing digital spear, she is also neck-deep in the murder case and among all of the craziness, try and get her life in order. First reaction following the completion of this book is that it's hilarious. It may not be to everyone's taste, but Dahlia Moss is a very distinctive narrator and she is not afraid to let her opinions be heard. The best thing about Dahlia is that she is very relatable. She is very human, prone to mistakes and setbacks in life and despite it all, she's happy to continue muddling her way through the problem until she reaches a solution. And it's not just Dahlia. There are plenty of fellow bizarre characters for you to be introduced to: the happy-go-lucky insane roommate Charice who's not above tailing detectives, online gaming addicts Threadwork and Clemency, even a brief guest appearance of the spirit of Wilfrid Laurier - Canada's most famous prime minister (well, top ten). Part of the comedy also stems from the fact that there is a heavy dose of fandom references. The book summary wasn't kidding that fans of Scott Pilgrim and Big Bang Theory (among others) will enjoy this. There is a certain entry-level of nerdiness required to appreciate all of the humour and catch all the references. Whilst Wirestone doesn't explain all the jokes or elements of every fandom, he does briefly detail enough about MMORPG so that the average non-geeky reader can follow alone with the main plot line. This book flowed nicely. There is the intrigue of the murder mystery with subsequent investigation unfolding very much like an episode of Law & Order. There is enough descriptions among the action that every scene can be played out in my mind as I read along. And when everything finally built up to the climax - let's just say it was the most bizarre event I've read in a long time. The only thing that I found a bit puzzling or out-of-place would be the romance. It doesn't play a very prominent role within the story, which is fine. Although it isn't very intrusive, its existence is so threadbare that I couldn't help but wonder if the story would have worked better without it. 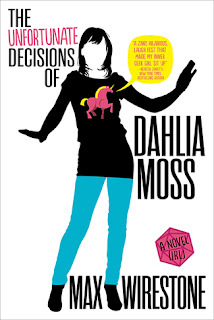 I really enjoyed The Unfortunate Decisions of Dahlia Moss! It's crazy, fast-paced and hilarious from beginning to end. While not every element worked for me, it was still an amazing experience and I can't wait to see what Wirestone has planned for us all next. Disclaimer: a complimentary copy was provided to me by the publisher via NetGalley in exchange for an honest review. The views expressed above are entirely my own and are in no way affected by the source of this book.